Nine conversations you may have around the table this Thanksgiving. 9. Cousin Claire's friend's sister's old roommate's new landlord lived in Paris for about a week, like, 10 years ago. But just so you know, she's totally fine. 8. Your woodworker uncle who won't stop making sanding puns about Bernie Sanders, claiming they're part of his "Bernacular." 7. Your 13-year-old brother explaining why he won't take off his Guy Fawkes mask because he wants to remain Anonymous. 6. The University of Utah football team and the fact that—Jeez! OK, I won't talk about it. 5. Which dish most resembles Donald Trump's "hair." 4. Who at the table would be first to die in The Hunger Games. 3. 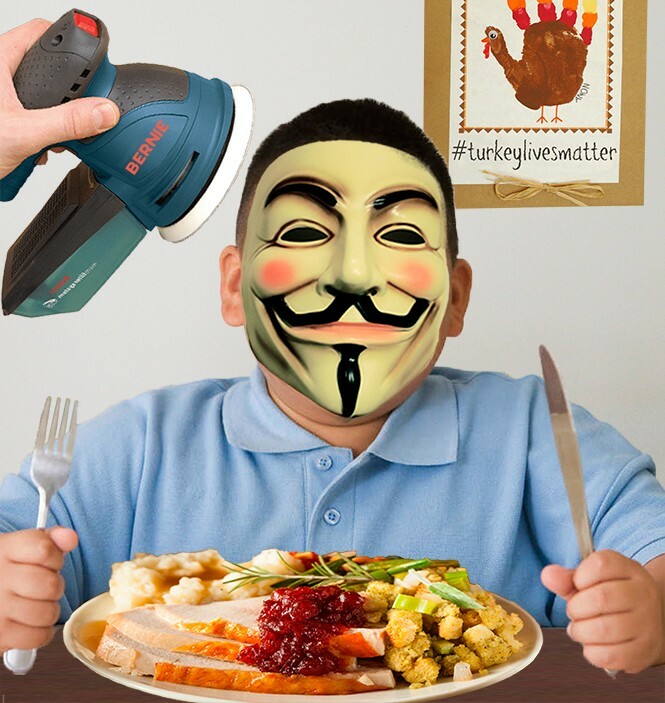 Your newly vegan sister muttering #turkeylivesmatter all through dinner. 1. Dad's new girlfriend extolling the virtues of locally sourced cranberries and gluten-free stuffing.